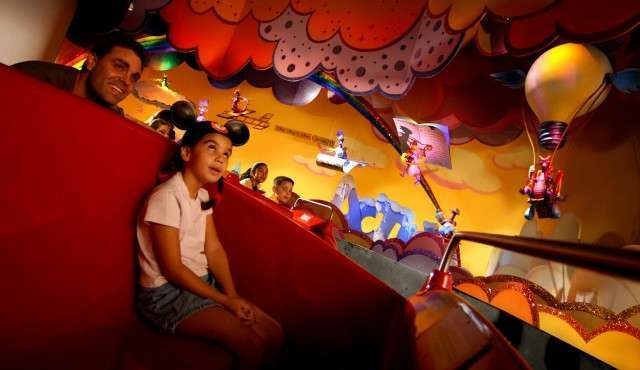 Journey Into Imagination with Figment! The thing that makes trips to a Disney park is that, usually, there’s a level of detail that shows some care and time, and yes, money, has been spent for your approval. This is a train-carried carnival. This is an experience that carries a sense of place, a sense of story, and a sense of journey. Disney, for the most part has done this successfully enough. Universal and Sea World, local competitors and terrific rivals, have tried this with some success as well. But when I look for an example, one would think I would turn to the Magic Kingdom and it’s strong attractions (the most visited out of the four parks, after all) and chime in. But for me, my heart lies elsewhere, because this attraction, along with the place, story and journey has something else that I cannot truly find elsewhere. A theme. A lesson that is very evident throughout and after the audience completes the experience. As an educator, it embodies what EPCOT originally intended to come out and do. Make us smarter while making us enjoy the experience. For many of the rides here in EPCOT, that concept seems to have been eroded, and that may be the location for another op-ed piece, but for now, let’s review this little corner of Future World. The Imagination Pavilion was originally sponsored by Kodak. I’m sure you’ve heard it. They used to make this thing called “film” that almost all pictures of the universe used to appear on before smartphones destroyed them, and us, with the “selfie.” It was a bit like a Children’s Museum, with hands-on activities and, since film was a large part, a 3-D movie theater. The ride was like nothing else that had opened in the young Future World of 1982. Instead of a mere study of the subject matter at hand (film), , imagination and creativity was the main crux. It brought us a narrator called “the Dreamfinder,” a red-headed professor type who collected sensory input, stored in your dreams and then a figment was formed. 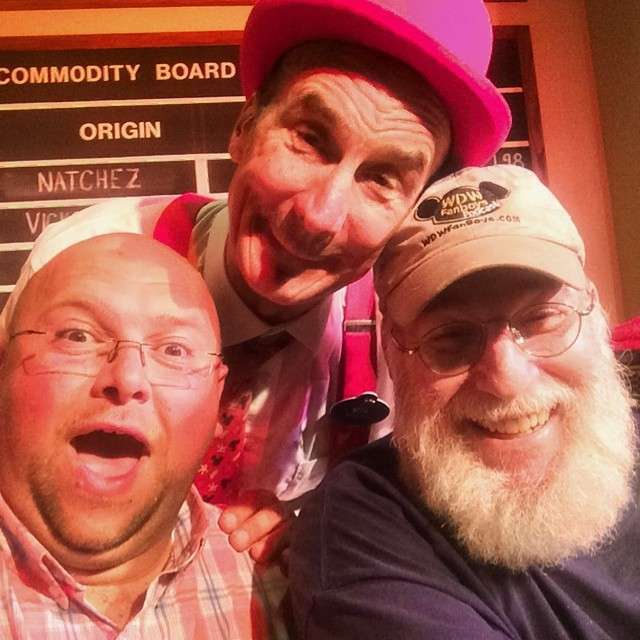 Jason having a fun evening with YeeHaw Bob, and Ron Schneider: The Original Dreamfinder! In this case, a living little purple dragon. You can see the recent tweet with our Fearless Leader, Jason, posing with the actor who provided the voice and character work, the wonderful Ron Schneider. And we’re talking a wholly realized character here, with a sidekick, Figment, that little purple dragon. ASIDE: If you ever get to hear this man speak, he’s is truly fun…and embodies what I’m trying to explain, poorly, here. I could elaborate on the terrific theme song the imagineers also came up with, but you’ll be humming it through the entire article here and be completely distracted. The ride was revamped when the lines got shorter, to see if they could drum up some traffic to this corner of the area, but they removed the beloved Figment character from the ride. This seems like an interesting choice, because outside of the Park system, the Imagineers (Disney Parks’ creative consultants and design team) selected the little guy as the perfect mascot for them and their team. 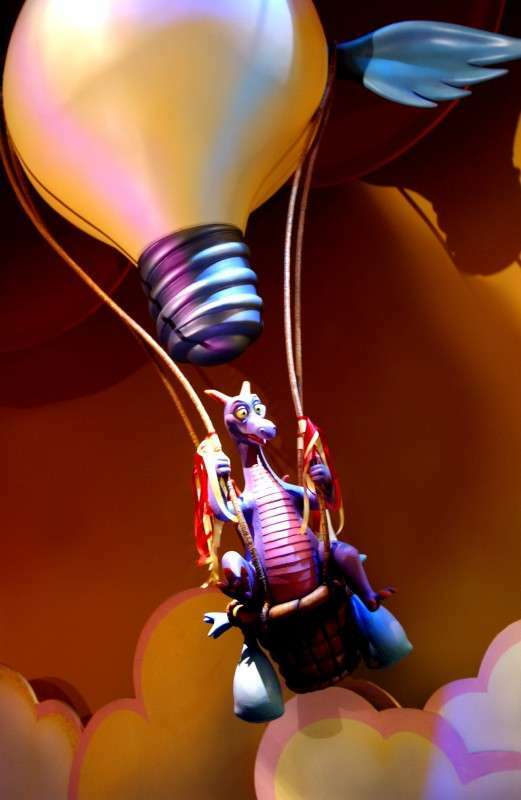 But Figment was gone, the internet uproar hit and the little guy was shoehorned back into the ride. And it works. It’s still, yes, one of my favorites. From the queue’s beginning to the ride vehicles, there’s a sense of place. We see offices and different doors with phones ringing behind them, giving us an idea that we’re at a wonderous lab, referred to as the Imagination Institute. Occasionally we see the purple winged dragon popping in on signs and details, but, hey, we could be mistaken. We then find we are about to join a tour of an “open house” of this local Imagination Institute, and each sensory lab where imagination is studied. We see a vision lab replete with cute optical illusions; a smell lab with an interesting choice of aromas; a sound lab where our slight of phrase becomes an auditory reality. The sense of place is profound. We see lab-coated details, whirring computers and posters that dance and come to life. This ride also has a bit of a story, something that seems only regulated to the cinematic presentations in these here parts. Sure, there’s a story on Ellen’s Energy Adventure and with Mission: Space, but when you have a movie, you can do that. But the story isn’t so clear on such pieces as the Haunted Mansion. Pirates of the Caribean did not get a full story until Jonny Depp poke his head into the ride. But here? On JIYIWF? Yes. A story that flows. We experiment with our senses as they experiment with theirs. The audience is caught up in the tale and the hijinks that come out of it. And as with every story, something goes wrong. This ride is no different in that manner. Because of the story flowing from beginning to end with the concept that your imagination is not limited by the senses, you feel, by the end of the ride, that you’ve gone from a point A to a point B. And it’s been happy and without violence or conflict. There’s no scares, but that does mean that there’s no thrills either. And there’s only two really obvious ‘jolts’ that are very clearly given “tells” to the guests, so that you are well aware of the scare before it happens…if you’re paying attention. To me, if I couple this ride with Spaceship: Earth, I find that you truly have an idea of what the whole original concept of what EPCOT was about. Exploring ‘heady” subjects with creativity and verve and having audiences being truly entertained by the experience. Should you ride? Absolutely. Fastpasses are a bit of waste, as there is rarely much of a wait for the attraction. It seats a great many people and usually sits empty until the rain or heat encourages others to ride. It’s truly family friendly. Also, it is one of the few rides with an original character. Not many other attractions can boast that. Truly, an old school dark ride favorite. Enjoy the simplicity. As I was just there recently, however, I also should mention, this pavilion is not what I’m talking about there. No way. There’s great ‘childrens’ museum’ potential in this empty shell. But? Without a sponsor? Disney has done very little with the awesome and colorful space beyond the small attraction. In fact, check out the latest tech hanging from the rafters in the gift shop. It’s a CD. A freegin CD. Aw, man, don’t ruin it for us, Disney folks!